Uncategorized | Excel Construction Services, Inc. The Excel Construction team is a hard-working bunch. So, in the Spring we like to get outdoors for some fun, food and camaraderie! On an overcast day in May, Excel employees came hopeful for some picnic fun with the entire Excel family! 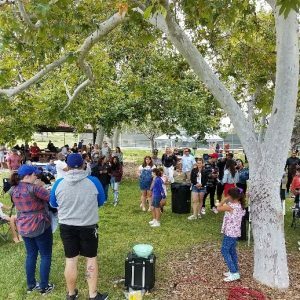 Excel Construction held their 3rd Annual Company Picnic at La Mirada Regional Park and all employees and their families were invited. To make sure that every employee got an opportunity to attend, there was no pre-scheduled work that day. Of course few of our staff were on call should any of our customers have an emergency. 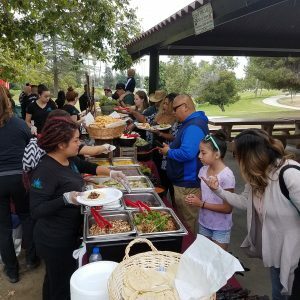 The picnic was catered by Blue Agave Southwestern Grill, a Mexican restaurant based out of the heart of Yorba Linda. Delicious Southwest Cuisine and dessert were served buffet style to attendees. The day was jam-packed with fun activities for the children. 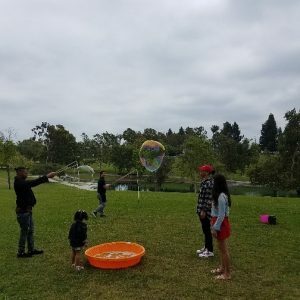 There were bounce houses, a bubble station, raffles to win gift cards, face painting and even a face painting contest to win big money! The face painting contest was so popular last year, Excel brought in three artists this year to keep up with demand. Participants in the face painting contest chose their own designs. An impartial team of judges, led by our President, Dan Jurado, reviewed the entries. Top runners up received gift cards for movies and dining. 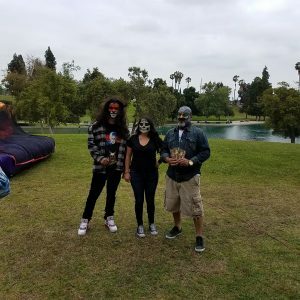 The winner of this years $1,000 first place prize in the face painting contest was Breana Rodriguez, Operations Coordinator. Thank you to everyone for helping to make this a great day for the Excel family! Every year JLL/Bank of America holds an annual bowling fundraiser to give back to the local Junior Achievement students. 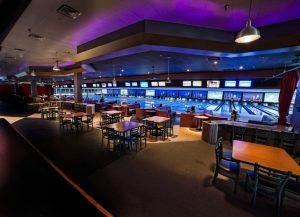 This year it was held at the Concourse Bowling Center in Anaheim on Thursday, March 22nd. Excel team members proudly in attendance were Karen Ratzlaff, CEO, Chris Mott, Chief of Staff, Kecia Ellsworth, Senior Account Manager, Tenice Hajali, Project Manager, Collette Marlatt, Customer Service Specialist, and Dave Jordaan, Director of Construction. Vendors and guests spent an afternoon bowling and a pizza lunch was provided. There were even prizes given out! Excel’s own Tenice Hajali won a cash raffle and graciously donated all the money back the to the fundraiser. Way to go, Tenice! Donations are always strictly voluntary and made directly in support of JASoCal. Last year, everyone’s partnership and generosity helped raise over $10,000 for JASoCal students. The goal this year was to raise $13,000! What a fantastic way to bring people together for some fun and a worthy cause! Let’s hope this year’s event met its financial goal so that next year’s goal will be even higher! 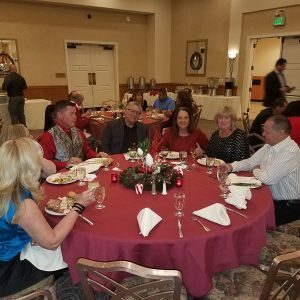 Excel Construction holds its annual 2017 Christmas Party at Los Coyotes Country Club! 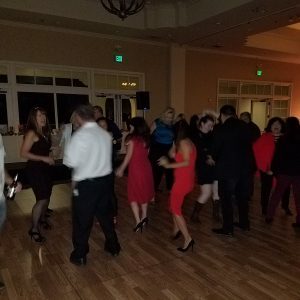 Comments Off on Excel Construction holds its annual 2017 Christmas Party at Los Coyotes Country Club! 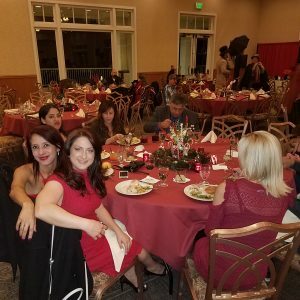 Every year Excel Construction hosts an annual Christmas party as a way to say thank you to our hard-working staff, and this years was the best yet! Held at the Los Coyotes Country Club situated in the lush rolling hills of Buena Park, the venue was fit for a Royal Wedding! The party was held in the grand ballroom featuring soaring ceilings, recessed lighting, rich Mediterranean-style furnishings and floor-to-ceiling windows with breathtaking panoramic views of the golf course and the lights of the city below. 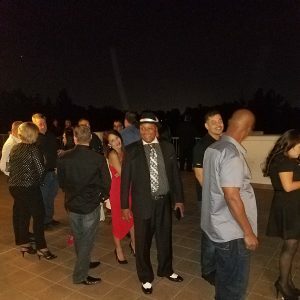 After leaving their cars with the complimentary valet, guests were greeted and received their name tags and raffle tickets. Staff from every Excel office were in attendance and the event was filled to the two hundred seat capacity with our staff and guests. As guests entered the ballroom they were immediately tempted by roaming platters of delicious hors d’oeuvres including culinary favorites like BBQ meatballs and shrimp cocktails. 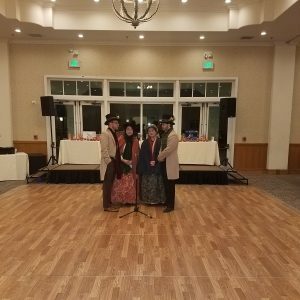 Christmas Carolers dressed in authentic garb made their way around the ballroom taking special requests and enhancing the holiday spirit. 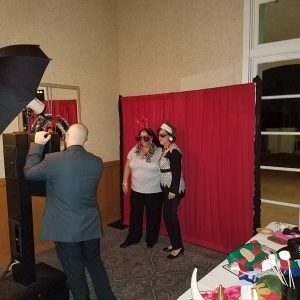 There was a fun and festive photo booth where guests could dress up in various Christmas costumes or silly accessories and receive a complimentary souvenir photo. Everyone had a great time socializing and relaxing, and some made their way to the cash bar outside on the veranda. The dinner was served buffet style and the main entrée selections were salmon, turkey and prime rib. Though dinner was quite filling, there was a line when the dessert table opened up. 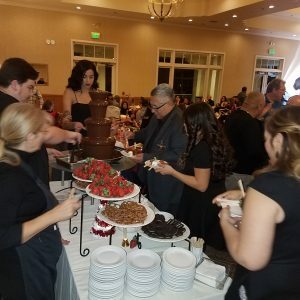 Back by popular demand was the chocolate fountain where plates of marshmallows, cookies, fresh fruit and more waited to be skewered and swirled in the liquid deliciousness. 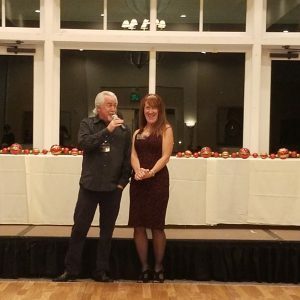 There were various raffles throughout the night. The prizes seemed endless, including gift cards, a Fossil watch, an Xbox game system, a Coach bag, and a Michael Kors bag, just to name a few. The audience fell silent as they anxiously awaited the pronouncement of each ticket number. Towards the end of the evening, the DJ began to work his magic. Karen Ratzlaff, CEO, led the fun on the dance floor. Even our Chief of Staff, Chris Mott, was seen dancing (though not well). The night was a success and everyone is already looking forward to next year’s party! Thank you to everyone who made this event a fun evening and to everyone who makes Excel Construction successful! The calendar might say that summer is over but Southern California seems to disagree! This past week as retailers were rolling out Christmas decorations, at Excel’s Fullerton headquarters temperatures reached as high as 105 degrees. 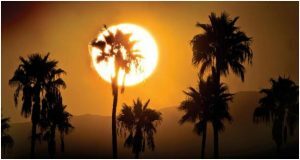 This time of year, the Southern California heat is no surprise and cooling units are essential if you don’t want to melt. 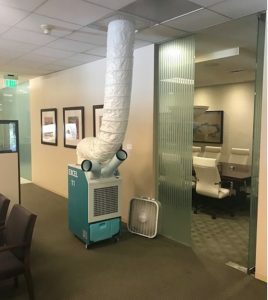 In an effort to beat the heat, Excel Construction is ready to provide customers with temporary cooling units in the event of a primary HVAC failure. The model Excel uses is MOVINCOOL® – Classic Plus 14. The MOVINCOOL® portable air conditioner is designed to spot cool warehouses, assembly lines, manufacturing plants, retail facilities, and even outdoor events. It’s also suitable for process cooling and moisture removal. Our technicians simply roll it in, plug it in, and turn it on. The unit is self-contained and easy to install and operate. It features programmable digital temperature control and handles temperatures up to 113°F. It also operates on standard 115V power. The units are equipped with flexible ducting that can be discharged to the exterior of the building envelope via a window or the existing HVAC system. Take that, So Cal heat! 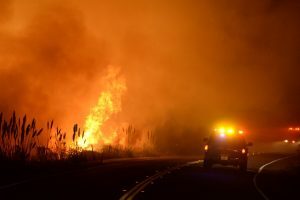 In the Western United States, especially during Fall, it is not surprising to see stories in the news about devastating wildfires. But what you might find surprising is that Excel Construction offers services to our customers to help them mitigate the impact to their facilities. 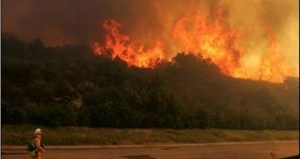 During the recent Southern California canyon wildfires, some unfortunate Excel customers in affected areas urgently requested air scrubbers. 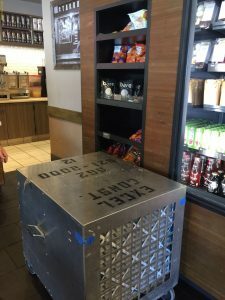 These valued customers wanted their stores to be comfortable for their patrons and employees, and to also minimize the environmental impact to their facilities. An air scrubber is a portable filtration system that removes particles, gasses, and/or chemicals from the air within a given area. These machines draw air in from the surrounding environment and pass it through a series of filters to remove contaminants. The air scrubber model Excel uses for customers is the “OmniAire 2200”. They operate at 2,000 cubic feet per minute and use activated carbon filters and HEPA filters. Excel technicians deliver and set up the air scrubbers. The technicians return over the rental period to change the filters and check their operation. And also return to remove them at the end of the rental period. They operate utilizing a standard 110-volt outlet so no special wiring or generators are required. The OmniAire 2200 is UL, OSHA and CSA certified for electrical safety, and operates very quietly. Excel Construction strives to be the #1 trusted service provider serving the Western U.S. They do so by building trust with customers, and that means providing prompt service when emergency services are requested. Excel Construction Services, Inc., pride themselves on successfully providing service to customers in their time of need. 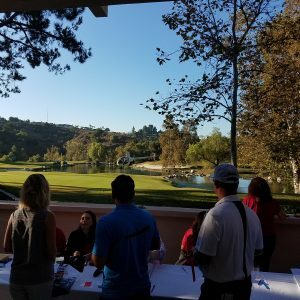 On one of the first crisp mornings of Fall, Bank of America held their 19th annual United Way Golf Tournament. 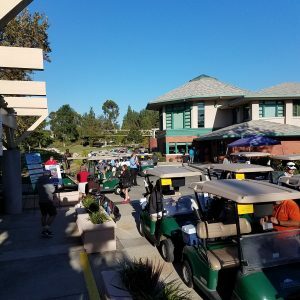 It was held at the beautiful Coyote Hills Golf Course in Fullerton. The organization goes beyond temporary fixes to create lasting change in communities around the world, they impact millions of lives every year. As of October 9, the United Way Network has raised more than $59.44 million for mid- and long-term recovery efforts related to Hurricane Harvey, Hurricanes Irma/Maria and the earthquake in Mexico. The morning started off with a Helicopter Ball Drop. Participants played “Ready Golf” to keep things moving and there was also a shotgun start. The afternoon concluded with a BBQ Luncheon which included both silent and live auctions. Participants placed bids on donated items to raise money for the United Way—the largest donation item was a 70” flat screen television with a retail value of $5,400! Dave Jordaan, Director of Construction, arrived for the luncheon and auction. Kecia Ellsworth, Senior Account Manager, served as a volunteer. Golf tournament participants included Bank of America and JLL employees, and vendors on the JLL/Bank of America account. Excel Construction golfers included Karen Ratzlaff, CEO, Chris Mott, Chief of Staff, and Jay Jones, General Manager. Excel Construction was able to participate by being a Platinum Sponsor of the event. 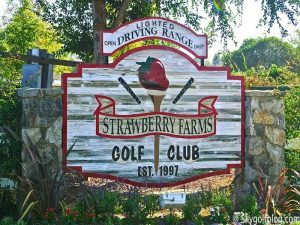 It was a day of friendly competition, food and drinks, live music and camaraderie with colleagues, clients, and corporate partners at the beautiful Strawberry Farms Golf Club in Irvine, California. 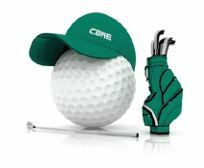 On October 5th, CBRE hosted their 6th Annual Charity Golf Classic. 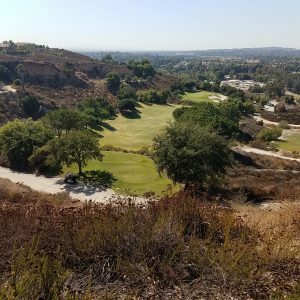 It was CBRE’s southern California project management invitational golf tournament benefiting Junior Diabetes Research Fund. Excel Construction was a sponsor of the event. JDRF funds research that transforms the lives of people with type 1 diabetes (T1D). Their motto is, “We want a cure, and we won’t stop until we find one. Along the way, we will continue to drive scientific progress that delivers new treatments and therapies that make day-to-day life with T1D easier, safer and healthier.” JDRF supports the best researchers doing the most promising, cutting-edge science to cure, prevent and treat T1D. Participants were encouraged to come and purchase a foursome, be a sponsor or just come to laugh and share stories with peers at the reception. There was an opportunity for everyone to get together and raise money for an important cause affecting 40,000 children and adults annually. The morning started with registration for the event while the driving range and putting green were open to participants. Around noon, they had a lunch box pickup followed by the tournament play that began with a shotgun start. 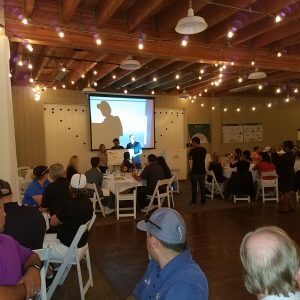 After the tournament, the day ended with a networking reception and silent auction followed by dinner and live auction. 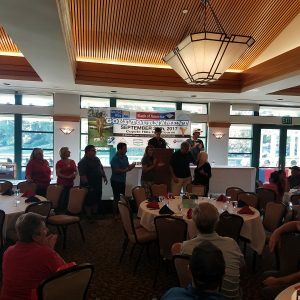 Excel employees in attendance at the fun and meaningful charity golf tournament were Kecia Ellsworth, Senior Account Manager, and Chris Mott, Chief of Staff. 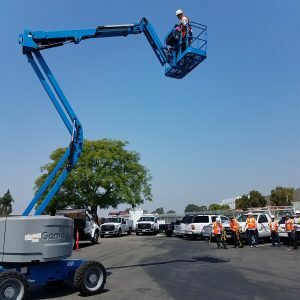 This past September, Excel Construction held a boom lift certification training at our Fullerton headquarters. The training was for Excel personnel and there were 18 attendees. 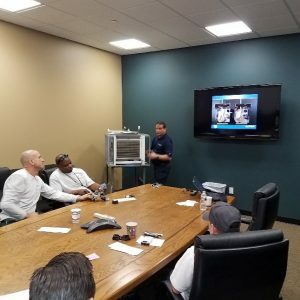 Excel’s Safety Manager, Cesar Galarza, conducted the training. Cesar is an OSHA Certified Master Trainer. 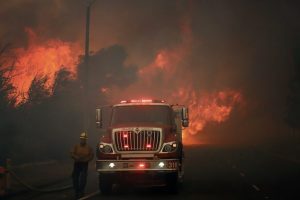 He is also a military veteran and a reserve firefighter with the Boeing fire department. In addition to conducting on-site safety inspections, he directs all of our safety training programs. 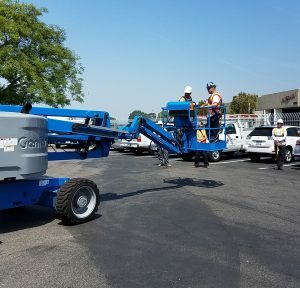 All personnel at Excel must be certified in order to operate our fleet of in-house equipment including scissor lifts, boom lifts, forklifts, backhoes, concrete saws, rollers, Bobcats, and more. Boom lifts, also known as “Knuckle Booms,” are very versatile units and work well in areas with hard to reach places. Telescopic Boom Lifts are aerial work platforms with sections that extend telescopically. They are commonly referred to as “Stick Booms.” These are typically used to reach over obstacles such as landscaped areas and overhangs, to reach facades, roof lines, and monument signs. 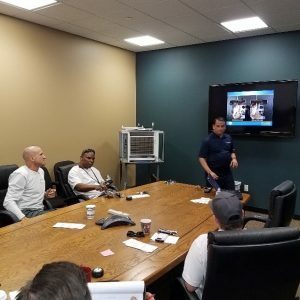 The training included topics such as safe use and handling, including loading and unloading from the transport vehicle, staging, ingress and egress, fall protection, and communication with team members. Each trainee received “stick time” and did not receive their certificate until they demonstrated mastery of all tasks. Excel Construction Services, Inc., believes that safety doesn’t happen by accident, so we are committed to preparing our employees to always have a safety state of mind. 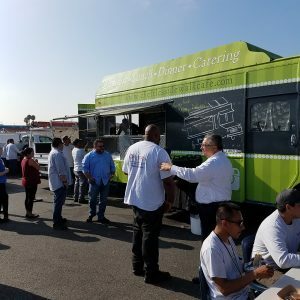 Every once in a while, Excel hosts a food truck to show their appreciation for their valued staff. 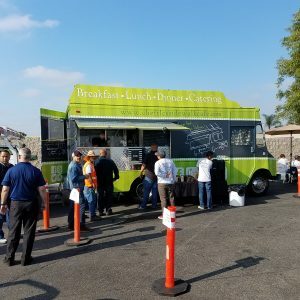 After our monthly Field Staff Safety Training meeting in July, all staff were invited to get breakfast at the gourmet food truck, Chef TLC’s Sidewalk Café. Chef TLC’s Sidewalk Café, out of Newport Beach, is known for their creative presentation and bursting flavors. They pride themselves on being affordable & offering fast service. They won ‘Best Food Truck of 2016’ from Newport Beach. 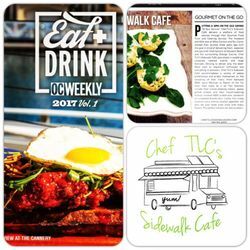 Chef TLC’s Sidewalk Café’s full menu is extensive and their Food truck/catering menu is event specific. On the menu for Excel’s breakfast were fully loaded and delicious breakfast burritos, side of fries and choice of orange juice or coffee. 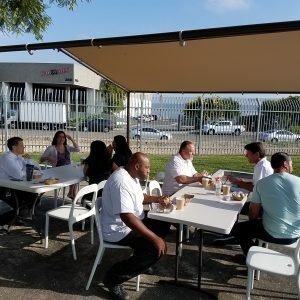 It was a warm summer morning and Excel brought out canopies so employees could enjoy their breakfast in the shade in our newly finished picnic area at our Fullerton headquarters. Immediately following breakfast and with a fresh cup of coffee in hand, our field technicians got back on the road and on their way to meet our customer needs. Thank you to everyone at Excel for all you do!